A 42 y/o male presents c/o palpitations. 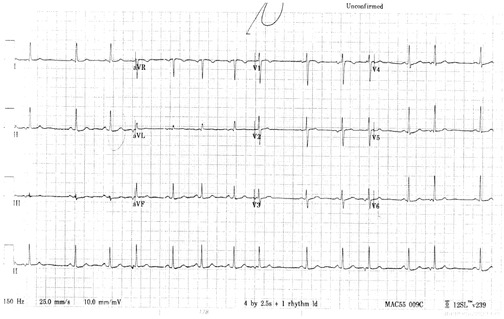 Because the sinus node is usually affected, the postectopic pause is not fully compensatory. A compensatory pause is seen if the PJCs do not conduct retrogradely. PJCs may be isolated, multiple (as in bigeminy or trigeminy), or multifocal. PJCs are uncommon in healthy hearts. They occur in CHF, digoxin toxicity, ischemic heart disease, and AMI (especially of the inferior wall). No specific treatment is usually required. Treat the underlying disorder.